Mua bán lenovo Thinkpad T430 14in tại Gò Vấp - bán Thinkpad T430 I5-3320M, Ram 4GB, HDD 250G, VGA Onboard. 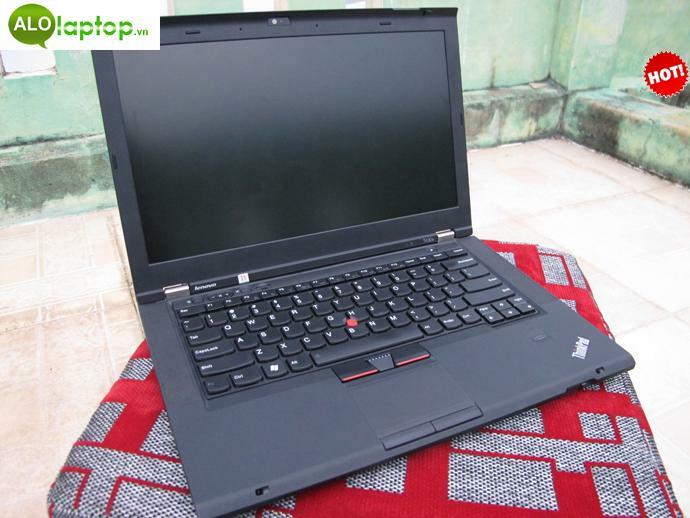 Thinkpad T430 14in nhỏ, gọn, chạy nhanh, mát, ổn định. Cấu hình mạnh, có thể chơi được game online như Liên Minh Huyền Thoại, Fifa Online 3 hay các game online nhập vai khác. Chạy nhanh - ổn định - độ bền cao - ít hư hỏng lặt vặt. Thinkpad dòng T series đảm bảo tính ổn dịnh - tuổi thọ cao khi sử dụng. 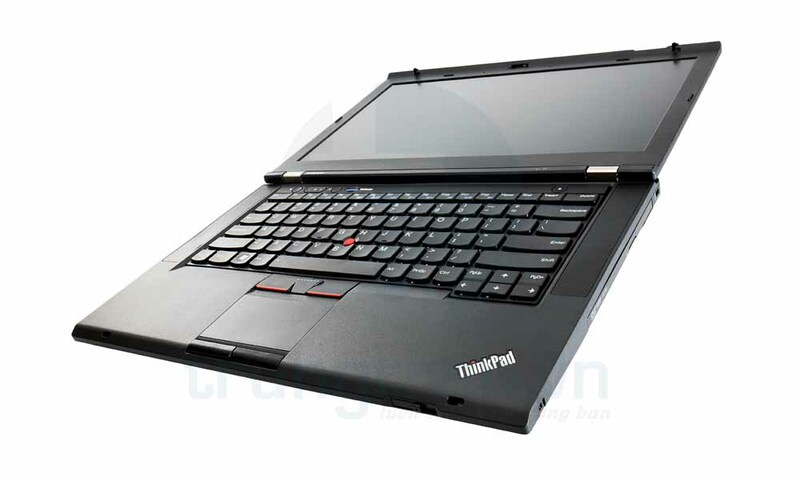 Là laptop cũ - nhập khẩu về và được phân phối lại cho người dùng T430 Thinkpad. Máy có thể nâng cấp lên được các đời chip I7 thế hệ 3 như: T430 I7-3520M, T430 I7-3630QM hay T430 I7-3720QM, T430 I7-3740QM. + Laptop được bảo hành 3 tháng. + Cam kết laptop chưa qua sửa chữa lần nào (zin). + Nhận gửi hàng COD cho khách hàng ở xa với chính sách - Nhận hàng - Kiểm tra - Thanh toán. 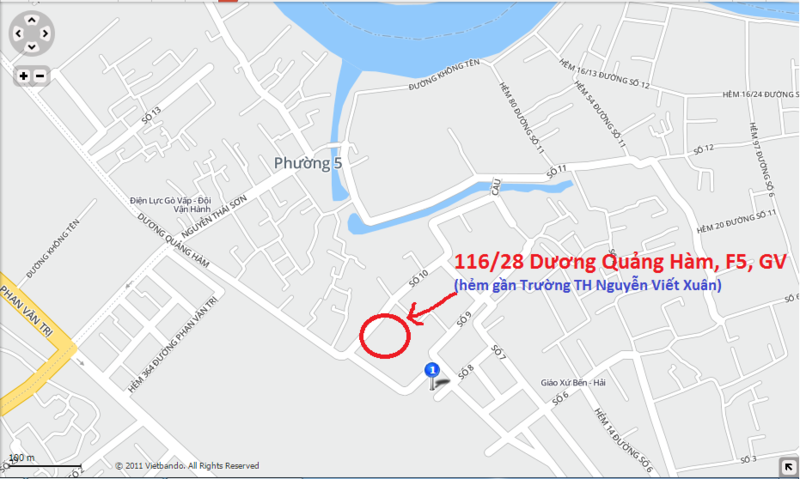 + Địa chỉ cửa hàng: 116/28 Dương Quảng Hàm, P5, Gò Vấp, HCM. Chỉ đường: khách đi thẳng đường Nguyễn Thái Sơn - gặp Dương Quảng Hàm rẽ tay phải - gặp trường học Nguyễn Viết Xuân - hẻm 116 bên phía tay trái của trường học. + Làm việc từ: 8H sáng - 22H hàng ngày (thứ 7, chủ nhật làm việc bình thường). + banlaptopxachtay.com nhận gửi hàng COD ( Gửi hàng - kiểm tra - thanh toán ) trên toàn quốc. + Trước khi gửi hàng, khách có thể kiểm tra thông số máy tính Laptop như CPU, Ram, HDD, Card màn hình...qua phần mềm Teamvier ( phần mềm điều khiển máy tính từ xa ). + Khách được xem hình thật của Laptop qua zalo/viber trước khi gửi hàng. Gentle evolution. Instead of taking a radical change, Lenovo steps gently in advancing their established ThinkPad series. The quick Ivy Bridge processors should increase the performance and innovations, such as USB 3.0, should demonstrate their will to improve. 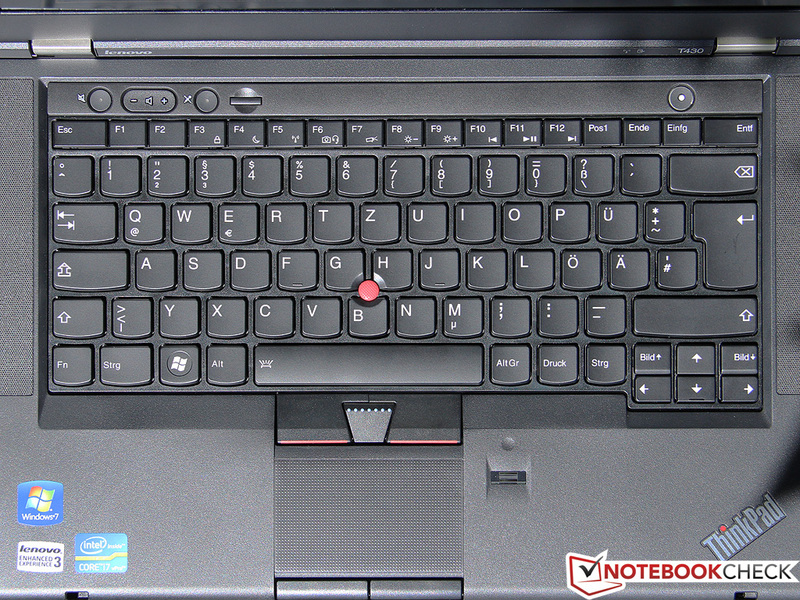 But how will adherents of the ThinkPad react to the first integrated Chiclet keyboard? If there is one notebook series, which can be described with the word ”timeless”, it would be the ThinkPad series of Lenovo (formerly IBM). For 20 years these dinosaurs of computer history have been known as reliable business devices and their high quality/value, for many business customers, often support a noble purchase price. Despite all the traditions the ThinkPads get frequent overhauls and upgrades. 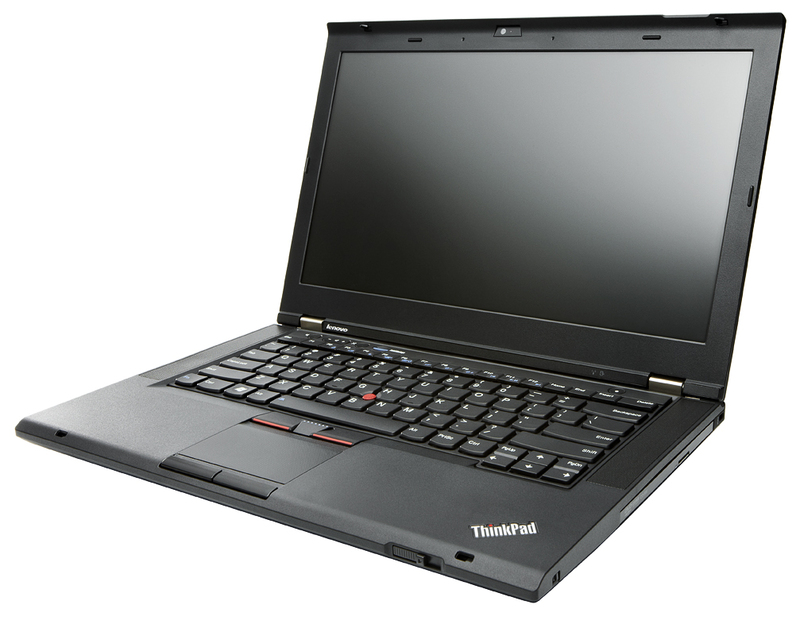 After we recently tested the models T530 and W530 we want to discuss the models of the T4xx series from the 2012 generation, more precisely the ThinkPad T430. 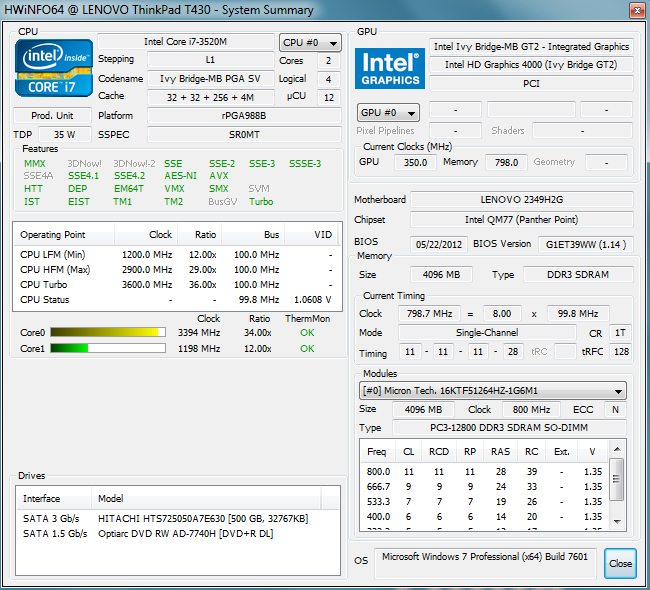 This succeeds the T420 and will be equipped as well as the other models with the recent Ivy Bridge generation of Intel. Our test device, which is the top model of the series with a price of almost 1600 Euros (~$2093) (T430 N1XH2GE) , is run by the fast Core i7-3520M accompanied by 4 GB of RAM as well as a 500 GB hard disk. Less expensive variants start at 1150 Euros/~$1504.The graphics will be handled by the professional NVIDIA NVS 5400M. Moreover the customer can be happy about integrated UMTS as well as an enormous 94 Wh battery. Typical for ThinkPad, their 14-inch WXGA++ display is coated with an anti-reflection layer in favor of ergonomics. The traditional competitors of the ThinkPad are the business notebooks from HP and Dell. The respective reviews of the new EliteBook 8470w and Latitude E6430 are still to come, thus we will compare it with their predecessors including the ThinkPad T420. Let’s start the battle in suit and tie! Robust and reliable are the most important properties of the ThinkPad. This has not been changed during the years therefore the design has a subordinate importance. The T430 and its sister models let us slightly think of Mercedes” G-Class: edged and primeval, but somehow also timeless and indestructible. The matte black upper surface; which is composed of carbon fiber, fiberglass and reinforced plastics, separates itself considerably from the shiny consumer devices. Neither the looks nor the dimensions (341 x 232 x 29.9 mm/13.4 x 9.1 x 1.18 in.) nor the weight (2.33 kg/~5.1 pounds, battery included) have changed significantly compared to its predecessor. Even with the smaller 6-cell battery - our 9-cell battery sticks out almost 2 centimeters (0.78 in.) - the notebook is not very special. Known from earlier reviews, the case presents itself as very firm, but some details can be improved further. Above the DVD drive or at the top of the keyboard the chassis can be bent under a strong load without reaching a critical level. Also the machining is not perfected as can be seen on various transitions of different materials. However we clearly want to emphasize: These are just optical shortcomings, which arise due to very critical inspection and are also partly present on the devices of the competitors. 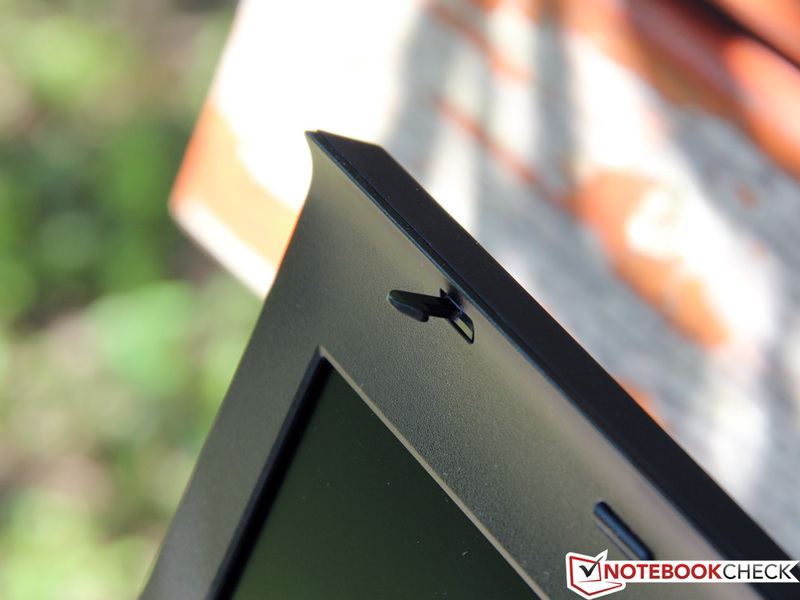 Many customers value their ThinkPad for the excellent metal hinges, which are also applied on the T430. These are one of the best on the market: Very tight, but absolute precise and without any clearance they hold the display, even during strong vibrations. The lid itself could be a little more resistant to warping. During transportation the known Clamshell design protects the display from dirt and damages due to an overlapping display frame. In total we rate the T430 as good as its predecessor. However, the business notebooks of HP and Dell from the last year did satisfy us a bit better in this regard so that Lenovo just earns the bronze medal. Good things come to those who wait: The ThinkPad T430 will finally be equipped with USB 3.0 ports. 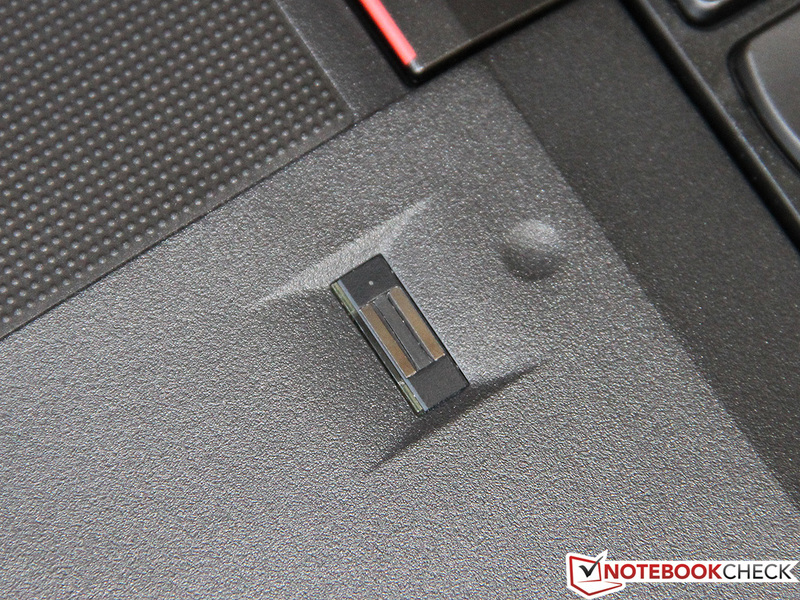 Lenovo even included two of the new ports, which enable the connection of fast flash drives without any losses in speed - at least theoretically: Both ports are indented slightly into the case which leads in many cases to a lack of space. Our Corsair Flash Voyager collided with the chassis and therefore it had to be connected to one of the two USB 2.0 ports. One of these has the Powered USB feature enabling the charging of USB devices while the notebook is off. Directly next to the two USB 3.0 ports the display output of the ThinkPad can be found, a Mini DisplayPort. The commercially liked HDMI output is not integrated and thus an analog VGA output is the only alternative for a connection to an older monitor or LCD projector (apart from adapters). Another specialty is the scarcely used ExpressCard/34 slot which was also integrated into the predecessor. 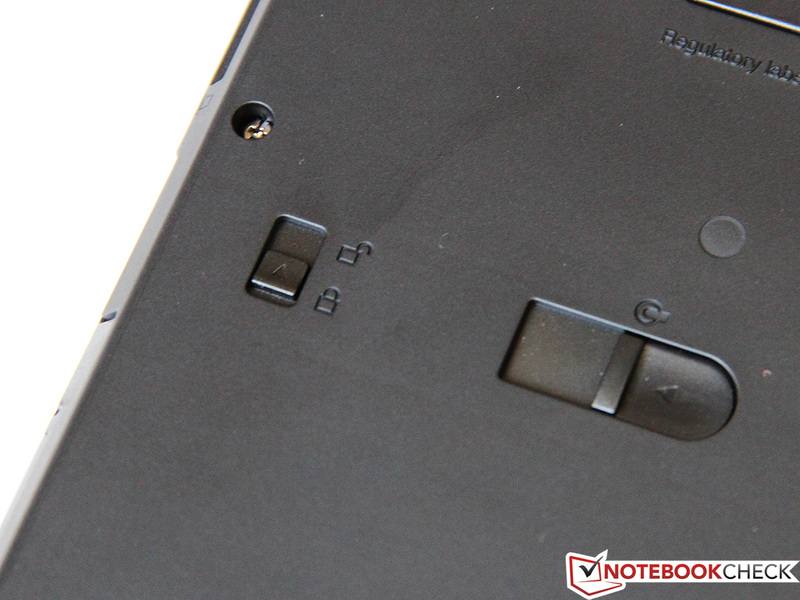 The connection slots of the T430 have been modified a bit, but can still be criticized. In addition to the badly indented USB 3.0 ports, the 4-in-1 card reader (SD, SDHC, SDXC, MMC) is not placed optimally. It would have been better to place the display output as well as the Kensington Lock next to the GBit-LAN on the backside and put frequently used connections near to the user. Typical for the ThinkPad series there is the connection for the docking station, which can be found underneath. Amongst others Lenovo offers the ”ThinkPad Mini Dock Series 3”, which is available for a price of almost 150 Euros (~$196) and is equipped with further connections (6 x USB 3.0, DVI, a display port). Alternatively a simple USB port expansion can be purchased from third-party suppliers. Talking about the support of wireless standards the T430 is outstanding. It starts with the chosen WLAN adapter: Intel”s Centrino Advanced-N 6205 transmits with IEEE 802.11a/b/g/n and connects to networks of 2.4 GHz broadband as well as of 5 GHz broadband. Due to two antennas and Multistream technology (2x2) it is possible to reach gross data rates up to 300 MBit/s while cheaper models often just reach half of it. Among many other features, referring to the respective product page of Intel, it supports for example the Wireless Display technology. But that is not all: Bluetooth 4.0 as well as a fast WWAN module including GPS (Ericsson H5321gw) is integrated as well. Connected to a modern UMTS/HSPA++ mobile network the user can be pleased about download rates up to 21 MBit/s (gross upload 5.76 MBit/s). Unfortunately LTE is not supported. 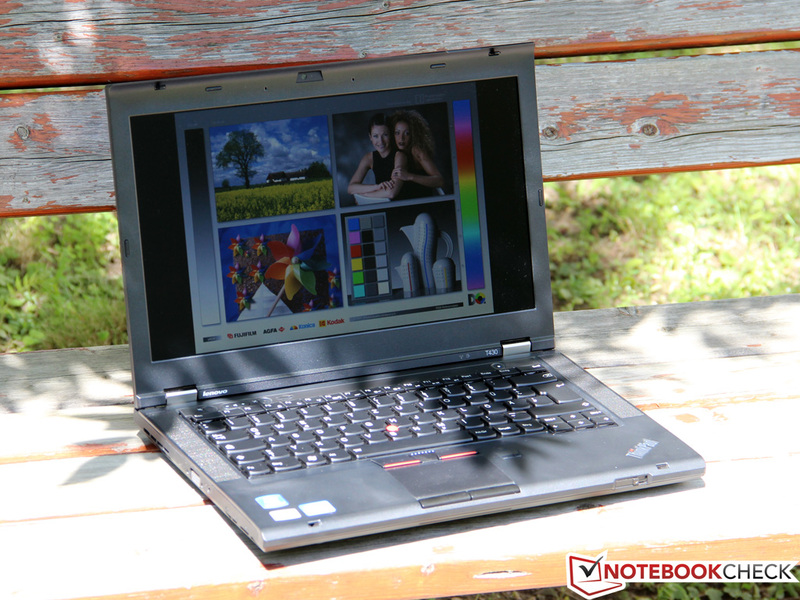 To participate in videoconferences Lenovo equipped the T430 with an integrated HD webcam (720p). A small LED indicates its activation. Compared with many other notebooks this webcam delivers a good image quality with high sharpness and low noise. The array microphone on both sides of the webcam has a very good speech quality although the recordings are lacking a bit of fineness at the high frequency range. 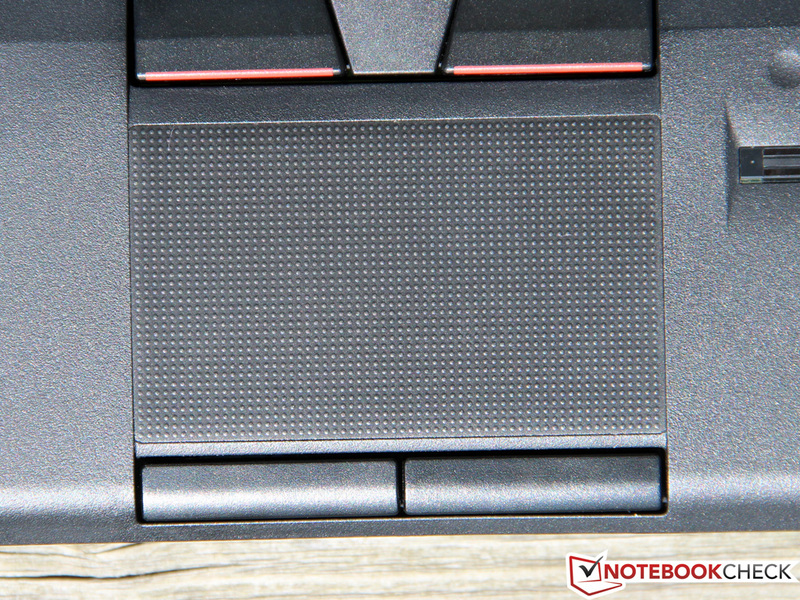 The fingerprint scanner has been included on ThinkPad for years and is also integrated into the T430. For more versatile security functions the manufacturer included a so-called Trusted Platform Module (TPM) according to TCG specification 1.2. The supplementary equipment turns out to be sparse: Besides some brochures nothing else is added. At least a driver DVD or a recovery DVD would have been desirable additions, which have to be created by the user himself in this case. Next to the pre-installed operating system, Windows 7 64-bit, are the necessary drivers as well as extensive software packages. The most important application of these is the so-called ThinkVantage Tool, which delivers a useful overview of many system properties. Among them; updating of drivers, modifying power options and managing scanned fingerprints. Underneath the device the maintenance panel secured with two screws is accessible. Behind it the second and still empty memory slot of the notebook, the WWAN module equipped slot as well as the BIOS battery can be found. Furthermore the DVD drive can be disassembled using a practical sliding mechanism to equip the UltraBay slot with other components. In general it is possible to disassemble the notebook further and almost any component can be exchanged. Lenovo offers therefore a detailed Hardware Maintenance Manual. However, caution must be taken: The user should have the necessary expertise and tools and be aware of the possibility of losing the warranty. It is recommended to advise the manufacturer directly in case of problems. Concerning warranty the other manufacturers can take a leaf out of Lenovo”s book. At least German customers get a generous 3-year bring-in warranty, which can be upgraded to a 4 or 5-year onsite service for an extra charge of 100 to 200 Euros (~$131 to $262) depending on the dealer. A ThinkPad with a Chiclet keyboard? ”Crime!’ some would shout with the expectation that the T430 will suffer a loss of quality with respect to its predecessors. Concerning looks and manufacturing these worries are unfounded: From now on the complete black plastic keys are convincing due to its excellent haptic and there is no indication of sponginess or other defects. All the letter keys are formed ergonomically and are slightly concave on the upper face to improve accuracy. In the dark the user will appreciate the traditional ThinkLight next to the webcam; alternatively a two-stage adjustable keyboard backlight can be activated. 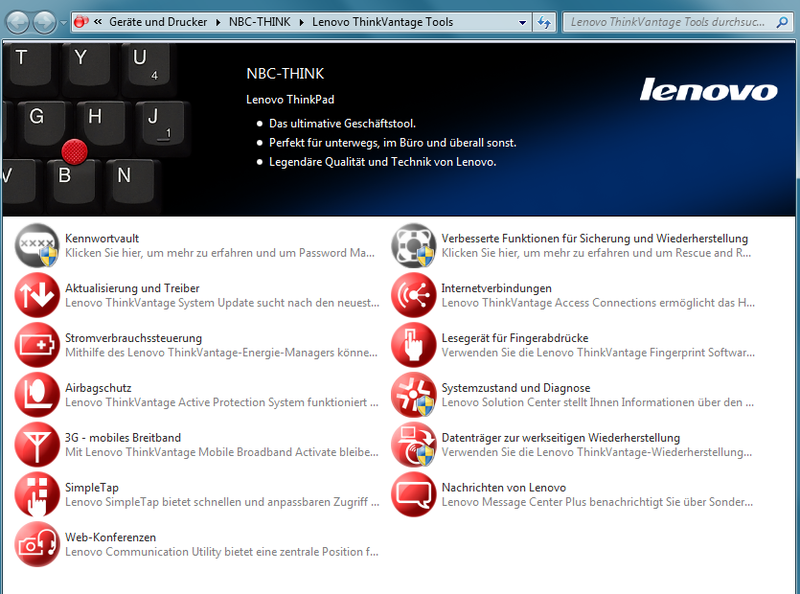 Concerning the layout Lenovo still has a mind of its own and swaps the Fn-key with the Ctrl-key. Fans of the ThinkPad might accustom themselves to this difference, but new-comers will find a different alignment of some control keys (Print, Del, Home, End,...). In general we have the opinion that the new design is tidier and arranged better even though regular customers might need some familiarization. And how is the typing feeling? It feels perfect! The pressure point is firm and stiff and impresses with perfect precision, additionally the keys deliver a comfortable and generous stroke length. At high writing speeds the keyboard gives a dull and mechanical rattling which confirms the firm overall impression without getting too loud or intrusive. For some the trackpoint is a needless relict from former times, others however appreciate it as a reasonable alternative to the touchpad. It is certain that the small red point between the letters G, H and B has its advantages by allowing the benefit of both a very fast and a very exact mouse control. Two quiet clicking buttons beneath the space bar serve as mouse buttons while in between the scroll function can be found. 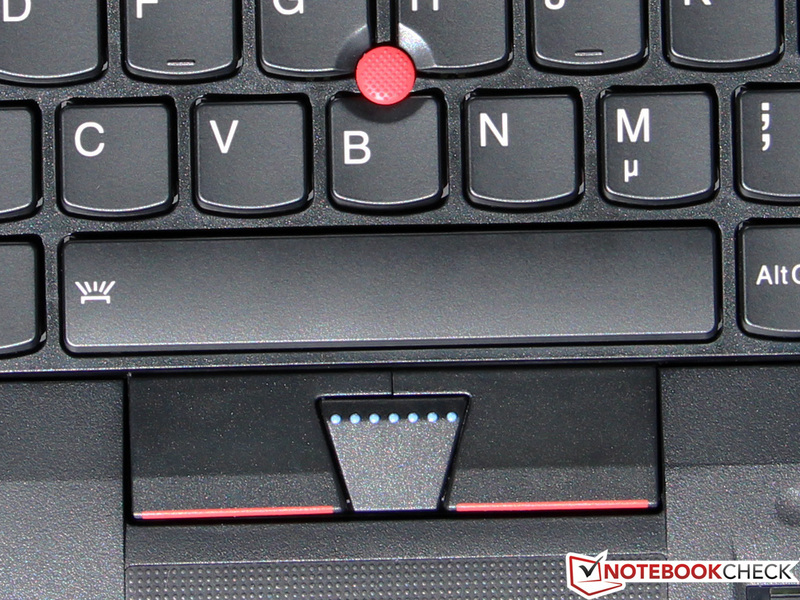 Under the designation ”UltraNav” Lenovo combines the trackpoint with an additionaltouchpad. It comes from Synaptics and seems to be fairly small with a size of 7.5 x 4.5 centimeters (2.95 x 1.77 in.). In return, the rough surface compensates for its size due to good sliding properties, high precision as well as the support of various mutlitouch gestures. It comes in handy that while using the trackpoint the touchpad deactivates automatically. Directly beneath the touchpad the manufacturer integrated a second pair of mouse buttons, which do not seem to have such a premium quality. Although the manufacturer integrated another display compared with the ThinkPad T420 (Lenovo LP140WD2-TLD2) it has almost the same cheap TN panel. Dark image sections have a lack of flotation depth due to a disappointing black level value of 1.47 cd/m² and that is the reason for a slightly improved contrast ratio of 178:1. However, the ThinkPad is not the only one: The direct competitors from HP and Dell have an equally bad display. 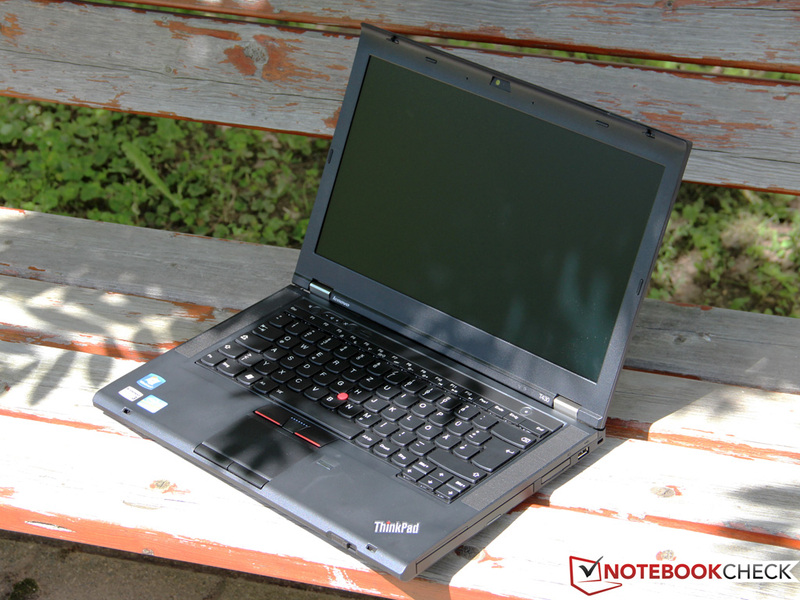 Even though notebooks such as the T430 are meant for business customers, it is not recommended for every working branch. Professional photographers or designer should look for other models as is demonstrated by the strongly limited color spectrum. 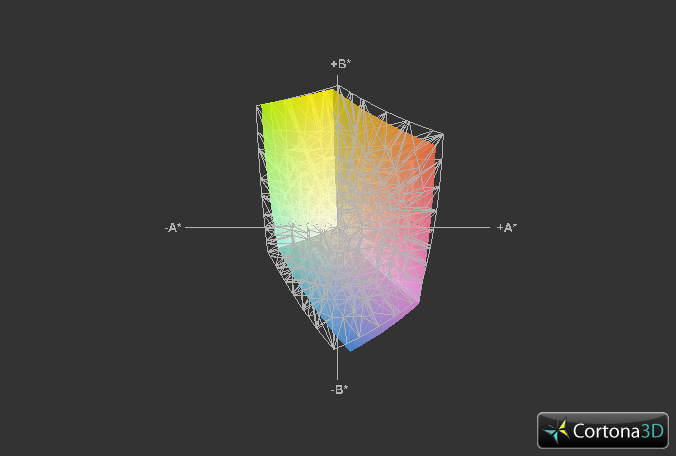 Neither the AdobeRGB nor the sRGB are completely covered for which a special WCG or a RGD LED backlight is necessary. Private users however are unlikely be affected by this limitation especially because just a few notebooks fulfill these requirements. The higher brightness makes it possible to read the displayoutdoors even better. Anyway, a matte surface is standard for Lenovo”s professional models in such a way that annoying reflections are prevented. Solely in direct sunshine the display loses the battle against its environment; but by turning the notebook away from the light source it is even possible to work outdoors during midsummer..
Another and very regularly mentioned disadvantage of TN panels is the stability of the viewing angle. 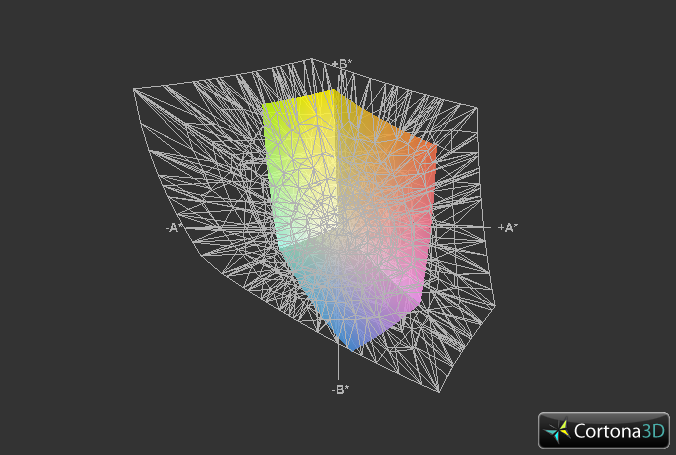 The ThinkPad T430 shows the same problems as many other notebooks with cheap displays: Especially a change in vertical angle leads to distorted colors and contrasts up to a completely unrecognizable image content. The operational range in horizontal direction can be considered a little more generous although it cannot compete with the IPS panel of the smaller ThinkPad X220. Finally we investigated the signal quality of the analog VGA output. Apart from a slight flickering especially at high resolutions nothing else can be criticized, nevertheless the operator should preferably use a digital output when possible. 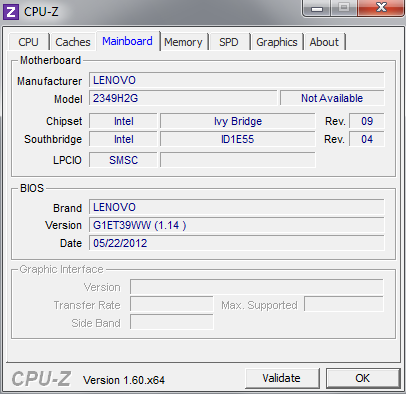 Potential buyers of the ThinkPad T430 can choose from three different processors of Intel’s current Ivy Bridge models. While the cheaper variant is either the Core i5-3210M or the 3320M, our test device is run by the current fastest dual-core CPU on the market, the Core i7-3520M. All the mentioned processors have a TDP of 35 Watts while the identically specified quad-core i7-3612QM is unfortunately not offered by Lenovo. 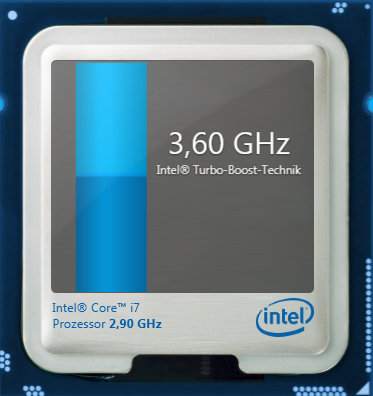 Even with just two cores the Core i7-3520M with a speed of 2.9 GHz reveals a considerable performance buffer, which can be increased up to 3.6 GHz (2 Cores: 3.4 GHz) thanks to Turbo Boost. The smaller Core i5 models as well as the 3520M support the hyperthreading technology, enabling the parallel processing of 2 threads per core. As small compensation for the considerable higher price the Core i7 scores with a bigger L3 cache (4 MB instead of 3 MB). The video display is either handled by the integrated HD Graphics 4000 or the NVIDIA VS 5400M depending on the model. All the notebooks with dedicated NVIDIA GPU - same as the test device - can access the Optimus technology for dynamical switching between both GPUs. With just 4 GB of RAM (1 x 4 GB Micron DDR3-1600) the notebook is equipped with a moderate configuration for current proportions, particularly with regard to on-going low memory prices. Also the chosen 500 GB HDD we would not consider to be generous, however it should be sufficient for the majority of operators as well as the memory. Although - as we have mentioned - Intel”s Core i7-3520M is the fastest dual-core processor that one can buy, the improvement with respect to the predecessor models based on the Sandy Bridge architecture seems relatively low. Compared with the ThinkPad T420 (Core i7-2620M) the advantage of the new model just amounts to 12 percent. During the single thread test of the Cinebench R10 the score increases from 5438 to 6074 points and during multithreading from 11507 to 12913 points (64-bit in both cases). The deficit with respect to the quad-core model is extensive: Even the smallest model, the Core i7-3612QM, is in the optimum case 70 percent faster. However, it is comprehensible that Lenovo limits itself to the nominal weaker dual cores. 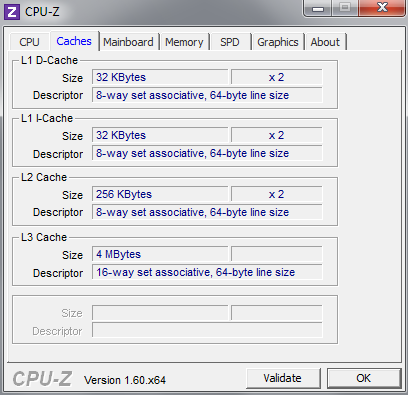 On one side there are the good parallelized 3D renders or video encoders, which can exploit the additional performance buffer of the other cores very wisely. 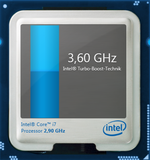 On the other side even an economical quad-core might demand a higher power, although it is classified in the same TDP class (35 Watts) by Intel. No SSD, no hard disk cache, just a classical hard disk - considering the purchase price this is kind of disappointing. After all we are dealing with the Hitachi Travelstar Z7K500 (construction height 7 millimeters/0.28 inches) which is a very fast model with just one platter, 32 MB cache and 7200 RPM. 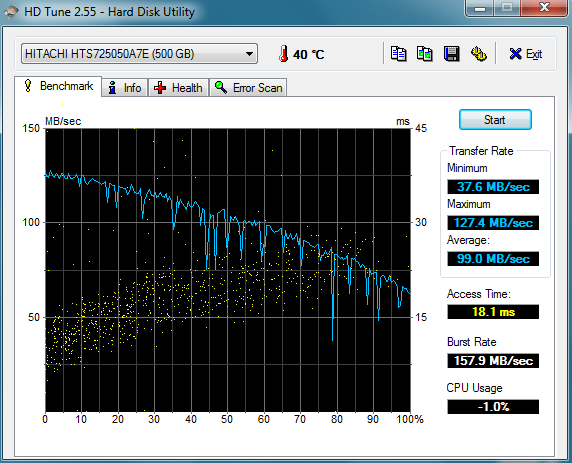 This is reflected in the remarkable transfer rate of almost 100 MB/s in the HDTune Benchmark, being - aside from the SSD competitors - one of the best hard disks. The access time of 18.1 milliseconds is however a typical value for mechanical hard disks, which actually depends only on the revolution speed. Even the cheapest SSD needs only 0.1 milliseconds, especially allowing the access of small files to be very fast. Those who like to purchase the ThinkPad T430 with an SSD (180GB) in Germany, have to accept on-board graphics and a Core i5-3210M. Another possibility would be to configure the T430 with an mSATA SSD. This would take the spot of the UMTS modem, which cannot be additionally placed on another spot. Different shops offer models with a capacity of 40GB - 256GB of varying manufacturers. Therefore it is possible to execute an upgrade on your own. However, we did not test the mSATA slot together with an optional SSD. Without an SSD and with just a small improvement of the processor performance the system performance remains on the same level as its predecessor - by no means poor. In the popular Benchmark Suites from Futuremark it reached a result of 8385 (PCMark Vantage) or 2430 points (PCMark 7), which are almost identical with the 15-inch model ThinkPad T530. During daily routine it might be difficult to find performance differences compared with the T420. The buffer of the processor however, is suited for almost every situation, although sometimes an SSD is preferred. The inevitable delay occurring when hard disks launch big programs would have been reduced with an SSD. 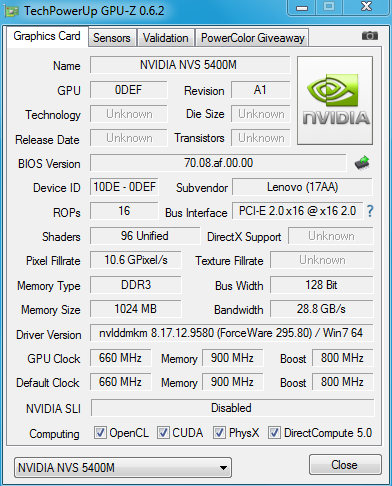 With the so-called NVIDIA NVS 5400M probably most users do not know what we are talking about. It is also known as the GeForce GT 630M on the consumer market, although this has a slightly higher clocking speed and is not especially designated for professional applications. Both graphics cards are based on the 40 nanometer chip GF108 or the newer 28 nanometer chip GF117. In our case we are probably dealing with the GF108 version, which is - aside from slightly higher power consumption - not different from the GF117 variant. 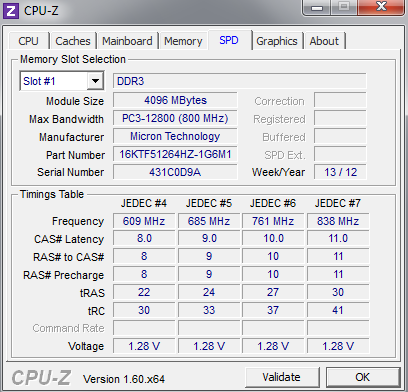 The NVS 5400M has 96 shader units (Fermi architecture), a core speed of 660 MHz (can be boosted up to 800 MHz) and a 128-bit memory slot, which is equipped with a 1 GB DDR3 VRAM (900 MHz) on the T430. However, the NVS series cannot be put on the same level as the expensive Quadro models, whose special drivers promise another performance increase in CAD software. That is also reflected in our benchmarks: The NVS 5400M is nip and tuck with the GT 630M during SPECviewperf 11, without revealing an obvious winner. The NVS 4200M, installed in last year’s T420/T420s, however, does not stand a chance. 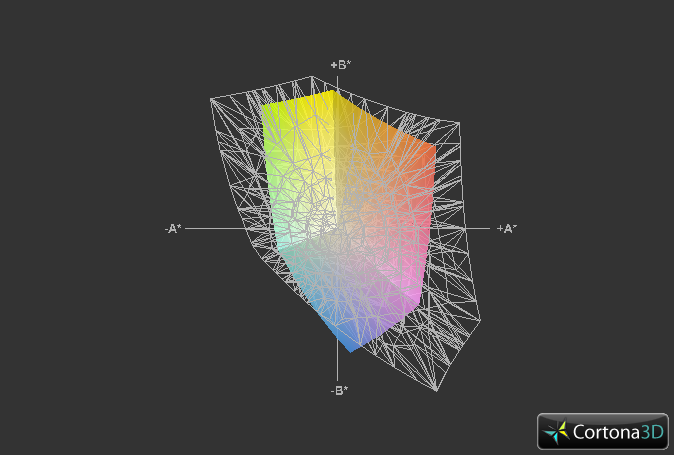 Likewise, similar performance is found during the classical 3D benchmarks of 3D Mark 11. In the case of the ”Performance Preset” out test device scores 1263 points, which is on the same level as notebooks equipped with the GT-630M. As well as its GeForce counterpart, the NVS 5400M can only compete with the lower mid-class graphics cards of the current standards. In order to rate the NVS 5400M even better we want to have a look at its gaming performance, although this might not be the main field of application of a ThinkPad. The high native display resolution of 1600x900 pixels asks too much of the notebook”s performance buffer during the majority of recentgames. 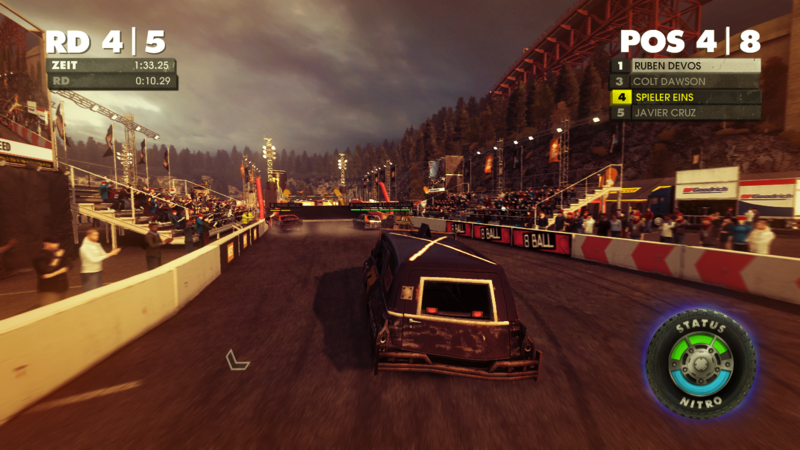 Titles such as Dirt Showdown, Anno 2070 or Deus EX: Human Revolution can be played with 1366x768 pixels and medium settings fluently. 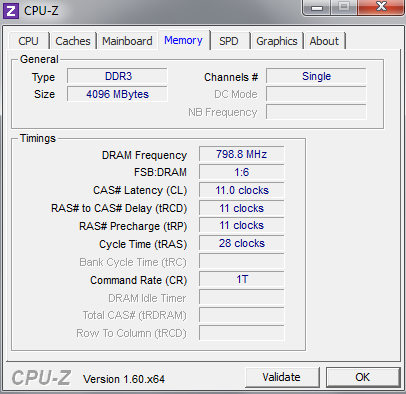 However, playing games such as Alan Wake, Battlefield 3 as well as Risen 2, which demand higher graphical performance, is only possible with even lower settings. In general the NVS 5400M, just as much as the comparable fasterGeForce GT 630M, can be used to play every modern game smoothly. Those expecting the best visual appearance, should look out for at least a GeForce GT 650M or faster - for these users the T430 is definitely not recommended. As with the predecessor the cooling fan runs the whole time, producing however, a quiet 32.2 dB(A) during idle state. Above all the volume level is absolutely constant and does not increase during browsing, video playback or modest multitasking. Only during accessing the hard disk is an audible noise present, which will especially annoy sensitive operators. Also during a higher load the ThinkPad presents itself in the best light. It is not as quiet as the T420 with 35.6 dB(A) during 3DMark 06, however this notebook did it without a dedicated graphic card. 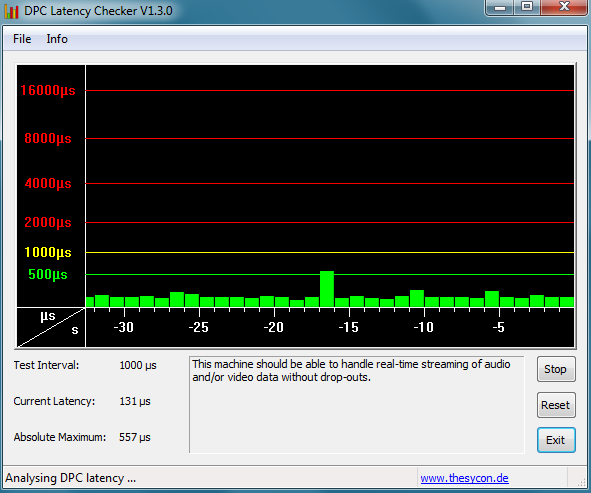 For the 2011 competitors Dell Latitude E6420 and HP EliteBook 8460p we measure considerably higher noise levels, which were not even reached by the T430 during the stress test. In the idle state the fan reduces its revolutions within a few seconds. The low system noise is achieved with a very conservative cooling system, which leads to expectedly high temperatures. At first glance the user does not notice anything during idle time: Despite the high temperatures of the summer the casing keeps very cool with an average temperature of 31 degree Celsius, which allows use on the lap. This changes drastically when we demand full performance. On many spots on the upper side as well as underneath the temperature rises above 50 degrees Celsius, even the average temperature of 42 to 46 degrees Celsius is very high. The left side of the palm rest is the most critical spot since its temperature becomes so high that it limits the usage of the whole notebook. However, these temperatures occur during the application of the intensive performance benchmark programs Prime95 and FurMark. Internally the processor and the graphics card heat up as well. 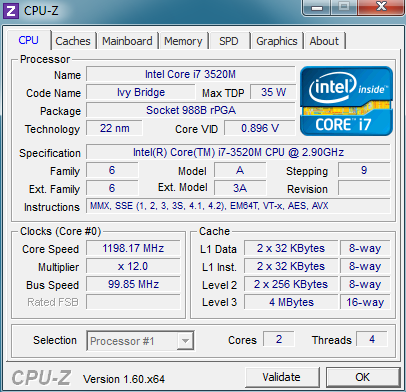 The Core i7-3520M settled at a value of 100 degrees Celsius after one hour during the stress test, but kept a clocking speed of 3.1 - 3.2 GHz. For the NVS 5400M we measured a slightly lower temperature of 92 degree Celsius, nevertheless it was throttled to 500 MHz periodically. Also here we would say this does not occur in practice. As usual the speakers of a business notebook are more an extra feature, since their practical usage is intended for playback of speech and system sounds. For this purpose the speakers of the T430 are sufficient but not beyond. Almost no bass is present and the maximum sound level is low, but the mid and high range frequencies are well-balanced. Altogether it is recommended to connect external speakers or headphones since a good quality jack output is present. Alternatively it is possible to connect modern receivers with the use of the DisplayPort (using a HDMI adapter). An additional GPU was one of the main causes for a high consumption during the idle state in the past. Thanks to NVIDIA”s Optimus technology this GPU should not have a negative effect on the power consumption. However, dispite the power saving features, the T430 surprises us with high power consumption between 10.2 and 17.6 Watts - almost 4 to 5 Watts more compared to the preceding model. When fully utilized the ThinkPad does not behave differently. 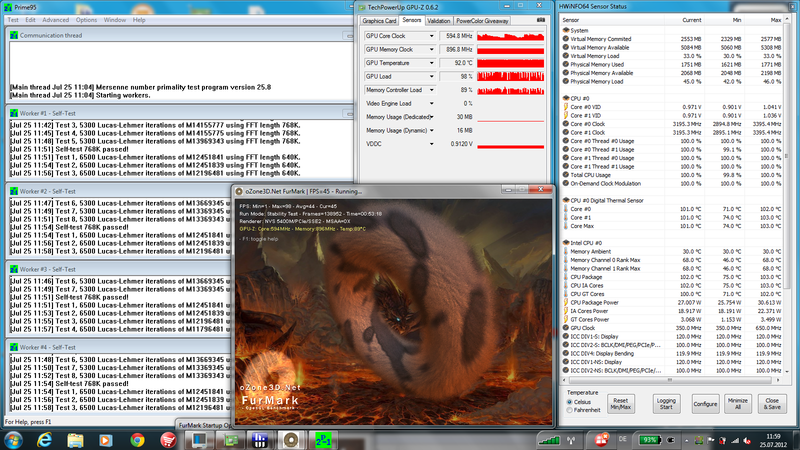 During 3DMark 06 the notebook consumes 72.3 Watts while during our stress test the value increases to 84 Watts. For a 14-inch notebook with a dual-core processor and a mediocre GPU these values are too high. We could not identify the cause for this directly, but it confirms our assumption that the equipped NVS 5400M is based on the old 40 nanometer chip GF108. Lenovo seems to be aware of this fact and provided therefore a dedicated 90 Watt AC adapter. However, we could observe, that the T430 used energy from the battery during full utilization. Our test device has a 9-cell battery with an enormous 94 Wh while other models of this series should manage with a 6-cell battery with 57 Wh. In addition Lenovo offers a battery-slice with another 94 Wh which was not included in our test package. Due to the high power consumption the ThinkPad gives away a part of its potential. However, it reaches a very good runtime. In the case of the Battery Eater Reader’s test (power saving profile, minimum brightness, the wireless modules and NVIDIA GPU off) the T430 has a battery runtime of almost 10 hours. 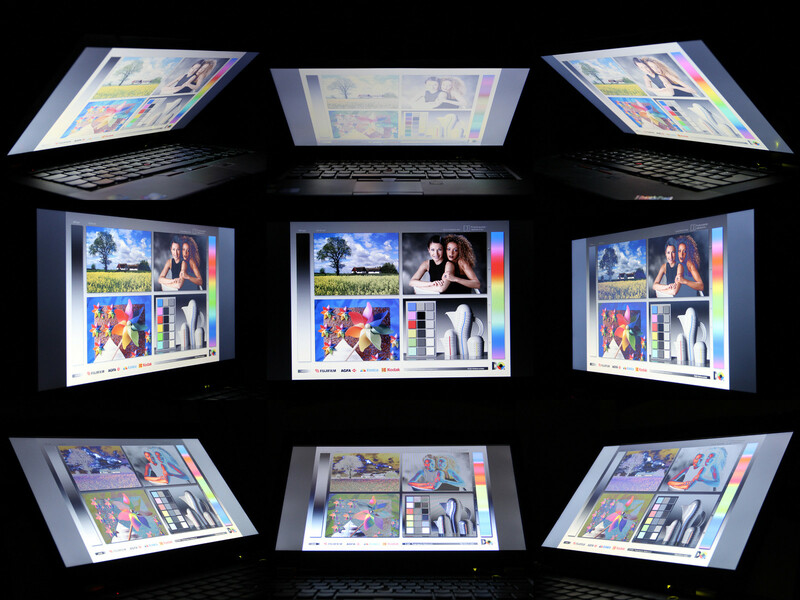 Imitating a realistic scenario, with the display brightness set to about 150 cd/m², activated WLAN modules and web browsing including video playback, the runtime still reached 6 hours and 29 minutes. Surprisingly the bigger T530 with identical configuration has a considerably longer runtime in our review. Those working with the notebook during traveling and demanding full power will be satisfied: Neither the processor nor the GPU are throttled when powered by the battery. However, a power socket should be close-by since in the case of 3D applications such as the Battery Eater Classic test (maximum power, maximum brightness, wireless modules and NVIDIA GPU activated) the battery runtime reaches barely more than 2 hours. To charge the battery some patience is needed because it needs more than 3 hours to restore 95 percent of the capacity. We did not expect the Lenovo ThinkPad T430 to be surprisingly different before the review. The Lenovo ThinkPad series has a lot of regular customers and these want to be maintained by the manufacturer. Yet Lenovo was successful in improving the predecessor T420 gently without losing its established qualities. It starts with the classical case of the series. It does not earn a prize for its beauty or best manufacturing quality compared to current standards, but with a solid and well-engineered architecture it has some advantages compared with its competitors with their noble aluminum chassis. Finally the ThinkPad is equipped with USB 3.0 although Lenovo should reconsider its positioning. Once in action the excellent input devices impressed us though we had been skeptical concerning the Chiclet keyboard. In addition the important details such as integrated UMTS and different security features are worth business customer”s while - even if they are known from the predecessor. In regard to performance the T430 is not a big improvement, however we were surprised at the high power consumption. This led to a disappointing battery runtime despite the enormous capacity - admittedly at a very high level. The temperatures turned out to be very high, because the cooling system is rather optimized with respect to system noise.